Sony PS3 Slim hands on review | What Hi-Fi? We've long been fans of Sony's extraordinary PlayStation3, and not only because we're dedicated players of Pro Evolution Soccer. Somehow describing it as a mere games console understates the astonishing breadth of its capability: a PS3 can play your DVDs and Blu-rays to a decent standard, store your digital music and photos, record your favourite TV (with the addition of the PlayTV module) and much more besides. Small wonder our readers bestowed the magazine's first ever Reader Award on it last year. And now, it's even better than before. 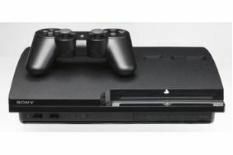 The PS3 has had a makeover, with the new version claimed to be 33 per cent slimmer and lighter than the original. Power consumption has also been reduced, with concomitant benefits to fan noise, while the new model also sports a larger hard disk than the standard PS3, with 120GB as against 80GB. The only downsides we can see are that it's a little less attractive, at least to our eyes – the matt black finish is somehow less alluring than the gloss of the previous model – and that, despite being slimmer and narrower, it's still quite deep front to back (deeper, in fact than the earlier version of the console). But no matter. What really counts is that while picture performance seems on a par with older models, the latest PS3 now boasts the ability to bitstream HD audio formats like Dolby TrueHD and DTS-HD from its HDMI output, a move sure to cement its appeal with home cinema buffs. Older players had to decode HD soundtracks on board, outputting them as multichannel PCM: in practice, this didn't necessarily amount to much, but it made the world of difference to frustrated AV buffs keen to see the requisite Dolby or DTS information scrolling across the displays of their AV receivers. Incidentally, we've no word yet as to whether this feature will be made available as a firmware upgrade to owners of older PS3s: keep an eye on whathifi.com for news as it comes. So far so impressive. What about quality? In essence, it's the same as before, which is to say very good for what it is. Sure, in outright quality terms, the PS3's picture doesn't quite stand comparison with a cheaper dedicated BD player like Sony's BDP-S360: playing both Blu-rays and DVDs, you'll notice slight losses in clarity, low-light detail and stability. But we think that's acceptable given the breath of the new console's abilities: in fairness, a dedicated Blu-ray player is lousy as a games console. So, five stars it is.